The system uses an eye-safe laser instrument to send light that "combs" the air to a flying multi-copter and analyzes the colors of light absorbed along the way to identify gas signatures in near-real time. The "comb and copter" system may be useful to scan for leaks in oil and gas fields, study the mixing of auto emissions and other gases in the boundary between the Earth's surface and the next layer of the atmosphere, or, with planned upgrades, detect pollutants or chemical threats and their sources. As described in Optica, researchers used the comb light to measure carbon dioxide, methane and water vapor—greenhouse gases that heat the atmosphere—along a 2-kilometer (1.24 mile) round trip path between a telescope on a NIST Boulder laboratory roof and a retroreflector mounted on a small, unmanned aircraft. The multi-copter hovered in selected spots to measure gases along a horizontal path and at various altitudes of up to 120 meters (400 feet). Higher-altitude flights are technically feasible but currently limited by unmanned aerial vehicle flight rules. 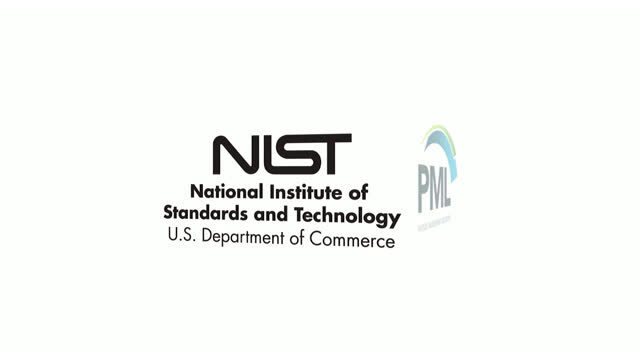 The results were even better than NIST's 2014 test of the laser combing system without a multi-copter. For example, the new system measured carbon dioxide levels of 1 part per million in just 60 seconds, compared to 200 seconds previously. "Now we can do the same sort of atmospheric measurements, with a little higher sensitivity, with a system that we can point to wherever we want," NIST physical chemist Kevin Cossel said. "The technology and sensitivity are promising." The laser instrument uses two frequency combs—measurement tools made up of thousands of precise frequencies or colors of light, like the teeth on a hair comb—to identify gases based on the amounts of specific colors of light absorbed. The 2014 test showed that the dual-comb technique can precisely, reproducibly sense trace gases in the atmosphere. In that work, the comb light sent by the telescope was returned from a mirror mounted on a nearby mountain. A reflector is needed to return the light to strengthen the signal before analysis by a detector at the telescope. The latest version of the instrument features several upgrades, including more power, an improved telescope and a lightweight retroreflector (a specialized 3-D mirror). NIST researchers also made the comb system more compact; it is now down to the size of a kitchen stove, so a vehicle could transport it. These changes, in addition to use of the customized multi-copter, make the entire system both more powerful and mobile. 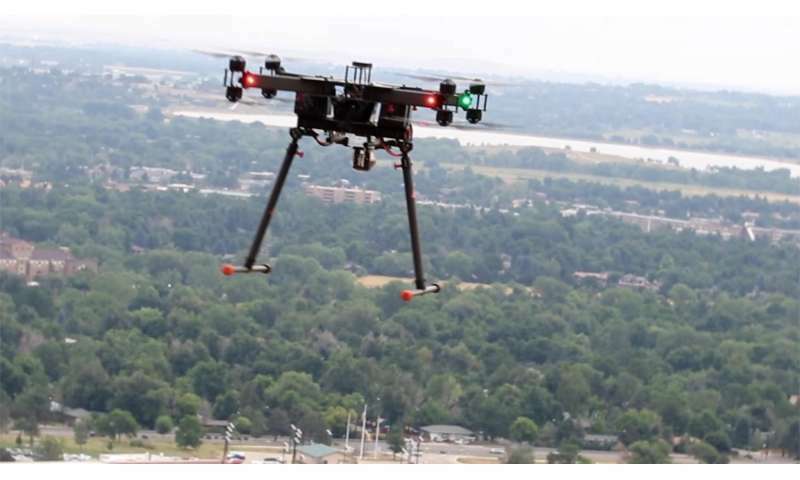 For all their laser expertise, NIST scientists found they needed to collaborate with unmanned aircraft flight experts on the University of Colorado's Integrated Remote and In Situ Sensing (IRISS) team. "Flying these things turned out to be challenging," NIST's Nathan Newbury explained. "It's not that easy to fly multi-copters—they have to be flown by someone skilled, or else the thing wanders off course, or worse, crashes. Anyone who's bought or received one for fun knows this." The multi-copter used in the experiment was fitted with a retroreflector as well as instruments for measuring location, temperature and air pressure, and path length. The telescope system must track the motion of the retroreflector as the multi-copter moves and hovers. The entire system retrieves gas concentrations every 10 seconds. The comb and copter system complements conventional technology. Mobile ground-based point sensors can make regional maps but must be driven in a vehicle or flown on a plane. Satellite instruments can sense atmospheric gases remotely with global coverage but sample specific regions on Earth infrequently and with only coarse spatial resolution. In the near future, researchers plan to use the flying comb system to study mixing in the Earth's boundary layer, a major source of uncertainty in atmospheric models, and to scan for emissions from oil and gas facilities, which can lead to the formation of ozone. The "comb and copter" system currently detects gas signatures in the near-infrared band of the spectrum. NIST researchers hope to extend that coverage to the mid-infrared, which would increase the number of detectable gases and enable applications such as scanning for chemical hazards and threats. Laser light in either band won't damage eyes, meaning it is safe for users and bystanders. In addition, longer flight times and path lengths should be possible as unmanned aircraft technology advances. The NIST group has already demonstrated that similar systems can operate over much longer path lengths of up to 12 km (7.5 mile) in a round trip. Need technology like this to get a more accurate read on the amount of methane emitted by subsurface microorganisms. (Methane breaks down to CO2.) Since we do not know the actual size of the input, it's impossible to quantify the actual proportion of "greenhouse gases" that are generated by human activities relative to the whole. Not knowing how much total CO2 is available, it's impossible to quantify how much CO2 the planet is currently recycling. It's likely the planet is recycling far more methane/CO2 than is accounted for by the climate models. Speaking of climate, this site has so far ignored the story, but the journal Nature Geoscience just published a significant reevaluation of the UN climate models which found their computed "forcings" to be too high. Researchers concluded that there was in fact a PAUSE (hiatus) in global warming which persisted after the big El Nino event of the late '90s.